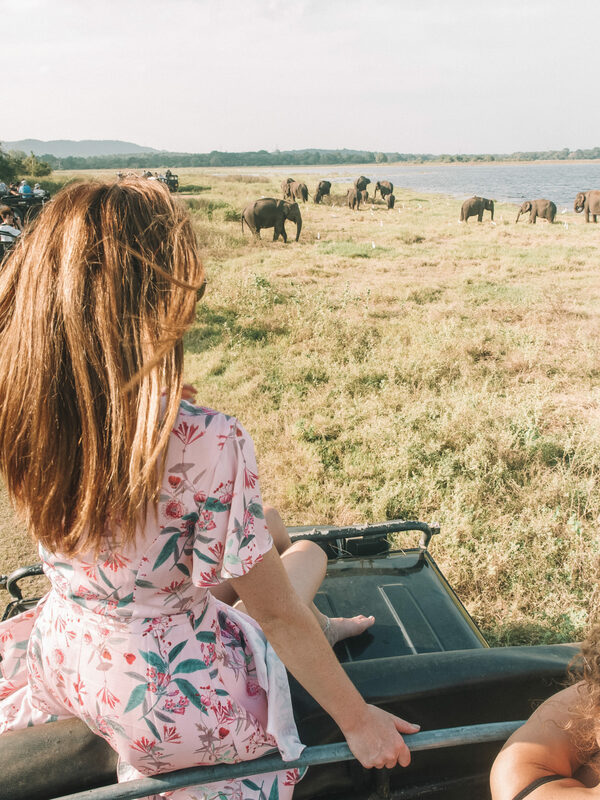 With its rich orange sunsets, endless beaches, playful wildlife and spiced curries, Sri Lanka is an unforgettable destination that will have you filling in dinner party conversations for years to come. Moreover, Sri Lanka is the perfect budget-friendly option for your first safari experience or a tropical getaway without the hefty price tag. Here are 10 great reasons to visit Sri Lanka and make this your next holiday destination! Ever wanted to go on safari but haven’t got the time or cash to invest in an African adventure? Sri Lanka is your next best bet. Throughout my time in the country I encountered so much wildlife, especially monkeys, but the most memorable was, of course, my Asian safari with elephants! If you’re a no-pain-no-gain kinda traveller, you will love the hike to the top of Sigiriya. The climb itself is not strenuous by any means, but the vertical incline and humidity combined makes for a unique experience. The entire climb takes a couple of hours return when fending off fellow tourists (the stairs get seriously crowded), so be sure to forego my mistake and arrive at the opening time. Other outdoor activities include surfing, cycling, rock-climbing and just about any outdoor adventure activity you can imagine (without snow, of course). This is a country renowned for its natural beauty, so do yourself a favour and enjoy the scenery any which way you can. It doesn’t take a pre-organised safari to experience all the wildlife that call Sri Lanka home. Monkeys are everywhere you go and are extremely relaxed around tourists (unless provoked – ugh! People!) Bird watchers will have a field day, along with the chance to see elephants and leopards on a jeep safari in one of the national parks. Spiced curries, fresh fruits and coconut water is just the beginning! Sri Lanka’s tropical climate means it is abundant in produce, particularly when it comes to delicious veggies and fruit. Vegetarians will rejoice in the wide range of curries on offer, thanks partly to the fresh produce and partly in thanks to the largely Buddhist population. Buddhism accounts for approximately 70% of Sri Lanka’s religious population, with many of the countries top attractions centering around temples, Buddha statues and religious sites. This offers a great insight into Buddhism and locals will only be more than happy to offer further information to help you gain a deeper understanding. Many of Sri Lanka’s traditions are passed down from India, so those who have already travelled to neighbouring India will draw a number of similarities. Sri Lanka is in contrast less busy and chaotic, with much of the country being occupied by rural farming. This is a great opportunity to travel to the countryside and enjoy Sri Lanka at a slower pace – learning about ancient traditions and rural living. The landscapes of Sri Lanka are extremely diverse: from surfy towns along the coast to a laidback country lifestyle through Kandy and the various tea plantations in the highlands. A great way to see the country is by roadtripping it, though train travel is also a great cultural experience. If you like to dabble in a little luxury on vacation then Sri Lanka is a great option to save and extend your dollar further. Certainly in Sri Lanka you will get more bang for your buck, with an emerging market for affordable luxury tourism. Last but not least – my favourite part about any country I visit is the people I meet and the stories they tell. From the tuk-tuk drivers to the village farmers, restaurant owners and everyone in between, I met so many amazing people on this trip. Sri Lankans are proud of their country and culture and welcome visitors like family to their businesses. Have you been to Sri Lanka? What did you love about the country!? Thanks to Sri Lankan Airlines for flying me to Sri Lanka for this whirlwind tour! SLA now fly direct to Colombo from Melbourne, daily. All opinions are my own. I have recently gone through an article regarding Srilanka and that was the time when i have been planning for a tour. i am going next month and this article is really helpful for me to know more about the place and what all i should cover there. Thanks, mate for this amazing one. Very nice article, keep up the good wook. I have not been to Sri Lanka, but I do plan to visit next year! Thanks for all the tips, this is a great article. I’ve been deliberating a trip to Sri Lanka for a while as I’m a bit worried it’s too touristy. This post has nudged me in the ‘yes’ direction! Sri Lanks is beautiful country and there are so many good things to enjoy. You shared amazing things of Srilanka which inspired to visit here. Wildlife things are best to see here and Great photos you shared of that beautiful place.